HELLP syndrome (hemolysis, elevated liver enzymes, low platelets) is a multisystem disease with a poor prognosis. 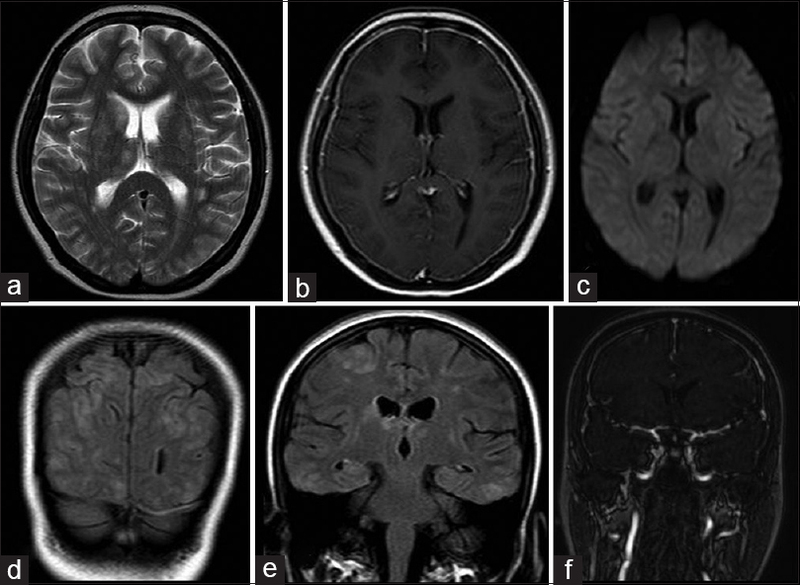 Posterior reversible encephalopathy (PRES) is characterized by bilateral symmetrical hyperintense lesions visible on T2-weighted magnetic resonance (MR) images in the subcortical-cortical areas. Intracranial hypotension (IH) is a syndrome resulting from decreased cerebrospinal fluid (CSF) volume, which is clinically characterized by orthostatic headache. The existence of these three states together has not been previously defined in the literature. A 24-year old female patient was referred to our unit due to epileptic seizures following a spontaneous delivery. The neurological examination revealed the following clinical presentations: a confused state of consciousness, opening eyes in response to verbal stimulus, and no signs of lateralization in muscle strength. The patient was considered to be having eclampsia due to the presence of an arterial blood pressure of 150/100 mmHg. The investigations performed revealed the following results –complete urine analysis revealed +3 proteinuria; hemoglobin (hb) level of 13.6 g/dl; platelet count of 46,700/mm3; alanine aminotransferase level of 715 U/L; aspartate aminotransferase level of 1970 U/L; and a lactate dehydrogenase level of 310 U/L. 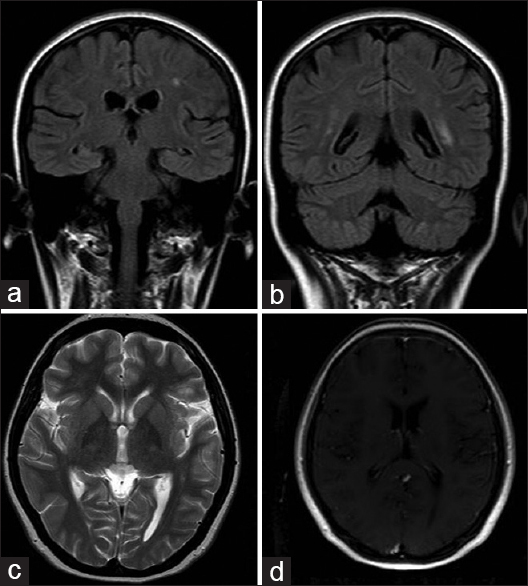 In the cranial magnetic resonance imaging (MRI), hyperintense lesions were visualized on the T2-weighted images in the cortex and white matter bilaterally in the occipital area; in the white matter, in the left temporal and right parietal areas; and, in the head of the right caudate nucleus and right thalamus. Diffuse dural contrast uptake was visualized on the post-contrast T1-weighted sections [Figure 1]. The cranial MR angiography and venography were normal. The cranial images and clinical signs of the patient were in accordance with those seen in PRES, and the diffuse dural contrast uptake on T1-weighted images was in accordance with the diagnosis of IH. On the third day of hospitalization, the values of Hb were determined to be 8.6 g/dl. On the seventh day of the hospitalization, the results of laboratory analyses returned to normal values. The patient's neurological and physical examinations at discharge were normal. In the evaluation, performed 2 weeks later, the neurological examination revealed normal signs. In the cranial MRI, the lesions that were seen on the T2-weighted images, along with dural contrast uptake on T1 contrast MR images, had disappeared [Figure 2]. IH is a syndrome that develops due to decreased CSF volume. It is clinically characterized by orthostatic headache. Patients may often suffer an epileptic seizure, following episodes of severe backache radiating upward from the waist. The etiological factors can include a lumbar puncture; dural lacerations secondary to spinal anesthesia, or spinal trauma leading to leakage of CSF; dehydration, uremia and metabolic disorders such as diabetic coma, which may result in decreased production of CSF or its increased reabsorption. In addition, major or minor trauma (due to yawning, sneezing, states resulting in the Valsalva maneuver, stretching, and sports) may initiate the symptoms. Our patient had not undergone epidural anesthesia during labor. We considered that IH developed in the patient related to the Valsalva maneuver during labor. Lumbar puncture (LP) is the gold standard to diagnose the presence of IH. However, we could not conduct LP in the patient because of thrombocytopenia. In the cranial MRI, performed 2 weeks later, the dural contrast uptake visible previously on T1 weighted images had disappeared. The association of HELLP syndrome, PRES, and IH has not been previously reported in the literature. However, there are an extremely small number of studies reporting the coexistence of PRES and IH. Pugliese et al., reported a case in 2010 in which headache and tonic–clonic seizures occurred 7 days after the epidural analgesia had been given prior to performance of a Caesarean section; in this case, radiological signs of IH and PRES were visualized on MRI. They remarked that this clinical state developed due to IH, which was secondary to epidural anesthesia; and IH led to hydrostatic edema and venous stagnation that played a role in the pathogenesis of PRES. In a case reported by Hammad et al., leptomeningeal enhancement with lesions indicating the presence of PRES were determined on MRI, 15 days after surgery for spinal fusion and laminectomy. They considered that PRES developed due to IH related to leakage of CSF, as well as increased arterial blood pressure. Our patient had increased arterial blood pressure; however, she had no history of epidural anesthesia. We consider that PRES existed in our patient secondary to hypertension and eclampsia, and IH existed secondary to the Valsalva maneuver applied during labor or as a result of disrupted blood-brain barrier that was caused by PRES. The coexistence of PRES and IH is rare. Our case had the coexistence of IH and PRES that developed secondary to HELLP syndrome. Schrijver I, Schievink WI, Godfrey M, Meyer FB, Francke UA. Syndrome of spontaneous spinal cerebrospinal fluid leaks and skeletal features of Marfan syndrome. Ann Neurol 1998;44:458. Pugliese S, Finocchi V, Borgia L, Nania C, Della B, Pierallini A. Intrcranial hypotension and PRES: Case report. J Headache Pain 2010;11:437-40. Hammad T, Dedent A, Algahtani R, Alastal Y, Elmer L, Medhkour A, et al., Posterior reversible encephalopathy a syndrome secondary to CSF leak and intracranial hypotention: A case report and literatüre review. Case Rep Neurol Med 2015;2015:538523.